The parameter m=1 in the address of a browser https://BLOG_NAME.blogspot.com/?m=1 indicates that someone is accessing our blog with a browser detected as mobile devices. A website can recognize them with an identity that we know as a User Agent (UA). Every browser is like an agent that will act as a bridge between the user and a website. In the blog service that we use today, there are two parameters that can be used by its readers. As we know that parameter m=1 is indicating that the user accessing it through the mobile device, there is also a m=0 parameters which is indicate that we are accessing the blog via desktop mode, but this parameter is not visible. Choose: No. Show desktop template on mobile devices. Please note that each of these parameters can be accessed at any time by the reader if they get a url that has a parameter m=1 or it can also be typed manually. When we activate the mobile view mode, what we actually do is we give redirect to our reader so that he gets the url with the parameter m=1. There are several advantages that we can get, like we can get the Template Design of two different views, which if we combine it with several conditions then we can set any part that will be displayed in mobile or desktop mode. 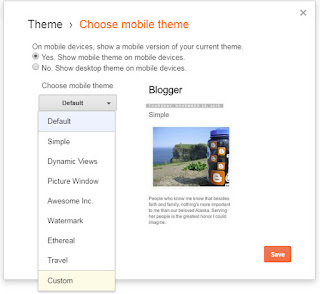 If we decide to activate the mobile mode theme, we will be given some template options what we will use. There are several built-in themes such as Simple, Dynamic View, Picture Window, Awesome Inc, Watermark, Ethereal, and Travel. And if we choose "Custom" mode, it means we use our own template to be displayed in this mode which looks like a desktop mode display, and of course if our theme supports responsive mode, it will follow it relative to the screen size. Mobile view mode is represented by data type: data:view.isMobile. This is Examples of giving rules to a widget with Conditional Attribute.